When you read and hear what former pupils tell from the primary school and other kinds of school, one fact is striking: Those who attended folk high school mostly have good memories from it. Many tell about the contrast between the primary school and the folk high school, or between the regular upper secondary school and the folk high school. The folk high school has mostly been a school with no marks or strickt curriculum. Still – or maybe just because of that – many tell that they learned more from a year in folk high school than in other schools. To many the folk high school has been the only education they have had after primary school, to others the folk high school has been the door which opened for further education, for instance teacher's education. Folk high school is a special kind of school which mainly have been in the nordic countries. The first one was opened in Denmark in 1844, in Norway in 1864. In Norway there have been three different kinds of folk high schools. At first there were the liberal schools, building on the ideas of the founder N. F. S. Grundtvig. Later there were alternative, Christian folk high schools and county schools. In North of Norway there have been all three kinds of folk high schools, and all of them have had Sami pupils. How did these schools influence the development and identity of the Sami pupils? It is difficult to answer this question, and as far as I know no one has done any research on the matter worth mentioning. But in the books about Sami School History some Sami pupils have told about their experiences in the folk high school, and in the 6th book we have had a look at six schools in Troms and Finmark and tried to understand how they have been working with the Sami. In this article we have a look at folk high schools that clearly have been part of the norwegianizing, in the next one we ask if there are folk high schools which have been working against the norwegianizing. 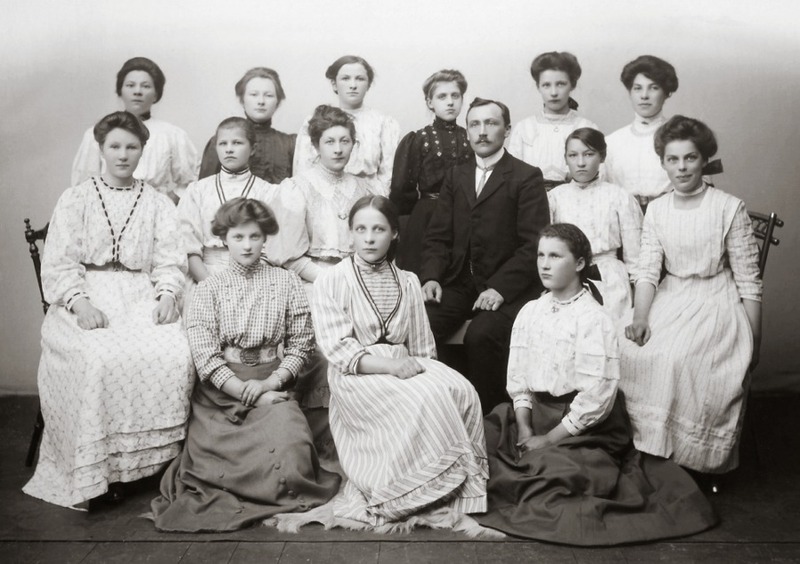 In 1900 Finnmark county council passed that there should be two schools, which then were named West-Finnmark county school and East-Finnmark county school. Both of these schools were in operation until the war, although East-Finmark county school was changed to Svanvik folk high school. «In the last years only Norwegian speaking youth have made applications to this school». East-Finnmark county school. Vadsø 1910. Girls' class together with the headmastert, Johannes Reiersen. Sami and Kven youth applied to this school to a much larger extent than to West-Finnmark county school. During the 34 years in service about 300 of 800 pupils had Sami or Kven as their mother tongue. It seems to have been a tougher struggle concerning the politics of norwegianization here compared to the school in West-Finnmark. The different headmasters at the school had a quite varied view on these matters. Johannes Reiersen, the headmaster from 1911–19, was a tenacious defender of the politics of norwegianization, which comes clearly across in his book Skolen i Finmarken. In 1920 Magnus Bremer became the headmaster. He had a completely different view, and had a close collaboration with Per Fokstad. Bremer worked hard to make the province grant a proper housing for the school, but was not able to get this through in the 1920's. The county council did not grant to build a school until 1930, but this was not built in Tana, but in Svanvik in Sør-Varanger, where the school was ready in 1936. At that time the county seized the opportunity to announce the position as headmaster vacant, several factors suggest that this was to substitute Magnus Bremer. In Tana there was a great displeasure among the people for loosing the school, and attempts were made to make the Sami Mission establish a Sami folk high school there and take over the housing and equipment from East-Finnmark county school. The director of schools Aarseth proposed to support this, but the county council refused the proposal. The result was that Tana lost the school offer. «According to the census the Sami speaking part of the population in Finmark is supposed to have sunken from about 30000 in 1930 to about 10000 in 1950. The most fatal year was in 1936. That was when the following happened: 1. The governmental norwegianizing folk high school school in Finnmark in Svanvik was started under the direction of a teacher who had been a missionary in China. It was built using a governmental grant which should have been used for a college for Sami. 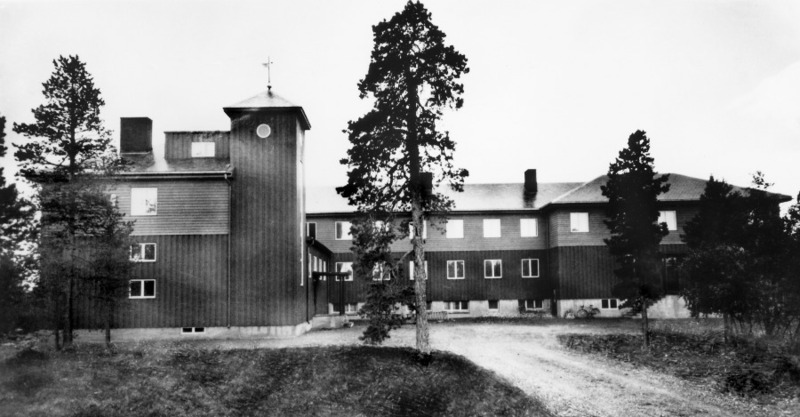 It is the only bigger institution in Finnmark which has not been reconstructed after the war. 2. The county school in Tana, which in particular was attended by Sami, was shut down. 3. The further education of Sami youth was left to Finneforbundet (an organization for mission among Sami), which started the Sami folk high school in Karasjok. When the county school finally got its own housing in 1936, the placement was not a coincidence. It was placed in Svanvik in Pasvik, close to the Pasvik river, which at the time was the boarder to Finland. The moving to Pasvik probably lead to a decreasing number of applications from Sami youth, in particular because the Sami folk high school in Karasjok was opened at the same time. In a report which the county governor and the director of schools sent to the ministry in 1936, it is written: «Svanvik, where the new folk high school is almost finished now, is one of our most exposed national outposts. The first land clearers from the side-valleys of Østerdalen planted Norwegian work, language and traditions in unfamiliar and harsh surroundings about three quarters of a century ago. ... Last year a chapel was built, and now our cultural ground clearing continues through the new folk high school. ... It is the best in our view on folk high schools which should be given growing conditions here, in order to make an intellectual fallow part of the Norwegian cultural life. This school is a national matter, and the position of the headmaster in particular is important.» With such a plattform it is understandable that Magnus Bremer was not wanted as the headmaster. In Lyngen Tromsø county school was established in 1912, later it was called Solhov folk high school. The first headmaster was Johan Hveding. He was a supporter of the political party Venstre (Left), adherent of the Nynorsk language movement, and a strong supporter of the norwegianization. Under his rule the school played an important part in the work for norwegianization in North-Troms. He wrote about the role the school should have: »And this people which have had such hard and sorrowful conditions, is that which shall grow stronger together, in a shared Norwegian culture to a united Norwegian people. (...) In this very important cultural work in North-Troms the first fixed county school in Lyngen was given its task.» The pupils were to «work in a Norwegian way, feel and act in a Norwegian way, in every respect live as Norwegians although they were from peoples so completely different to ours. Here they were to learn the Norwegian language and acquire Norwegian public education and customs.» In accordance with this way of thinking Hveding also committed himself to norwegianize Sami and Finnish place names and in searching for traces from Norse settlements and evidences that North-Troms at first had been settled by Norwegians. 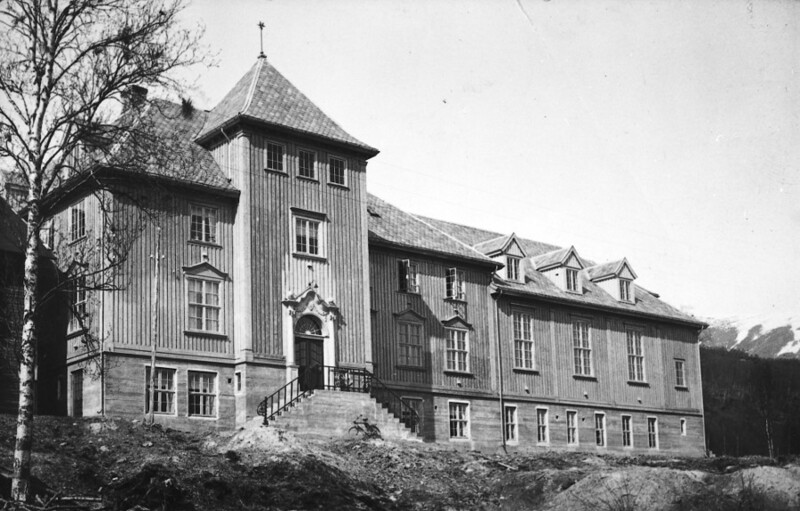 The main building of Solhov folk high school was built in 1923-24, and it is the biggest wooden house in Northern Norway. Norwegian culture was to pervade different subjects in the school, such as history, singing, school kitchen and crafts. A separate course of study for woodcarving was established, where the headmaster himself decided that the main focus should be on the Norse dragon style. The direct opposition to the politics of norwegianization was weak. But when the school in the public talk was given the nickname «the Great Norwegian», it probably indicates that this politics did not always have the complete support in the village. In the 1930's the Kven part of the local population was suspected to be agents for «the Finnish danger». Leigland strongly warned against Finnish people travelling around Norway to encourage the Kven to hold on to their own language and culture. During the war the school was requisitioned by the Germans, but not burned, and the teaching was started quickly when there was peace again. For some years the school was attended by many pupils from Finnmark who had lost their schooling due to the war, some years the pupils from Finmark made up about half of the school. In the postwar period the norwegianization was well on the way to being accomplished in North-Troms, in the sense that most of the pupils who came to school had Norwegian as their mother tongue. The school also did not have such driving forces working for an active norwegianization as the two first headmasters had been.